Programmable computing boards have just got a whole lot more accessible, with Raspberry Pi launching an all new device that's 40 percent faster than the original $25 model from 2012, smaller than a credit card, and priced at just $5. The Raspberry Pi Zero, as it's known, comes with a Broadcom BCM2835 processor, featuring a 1.0 GHz ARM11 core, as well as 512 MB of RAM. On the 65 x 30 mm board there's two micro-USB ports, a mini-HDMI port supporting 1080p output at 60 Hz, a 40 GPIO header, and a microSD card slot for storage. 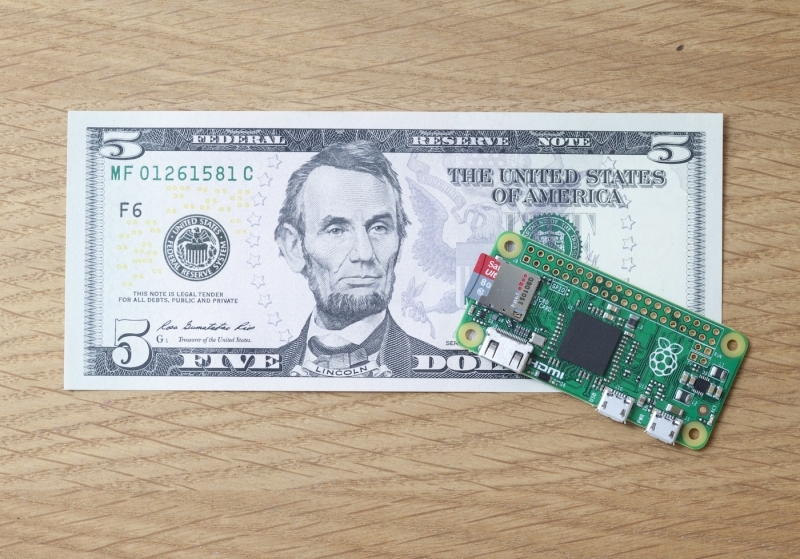 While this new Raspberry Pi isn't as fast as the latest $25 second-generation Model B, at $5 the Zero presents excellent value for someone needing a basic programmable computing device. The board is still able to run Raspbian, a version of Linux specifically developed for Raspberry Pi, and apps such as Minecraft, despite its low price tag. As expected, there are some trade-offs that have been made to keep the price low. There are no full-sized USB ports, so connecting USB peripherals will require a powered bus. There's also no on-board networking or standard audio jack, so it won't be as straightforward to add Ethernet or sound to the Zero. The Raspberry Pi Zero is now on sale through the same electronics retailers as previous Raspberry Pis in both the United States and the UK (where it costs £4). The Zero will also be bundled for free with copies of the company's £5.99 magazine MagPi, making it the first computer to ever be given away with a print magazine.